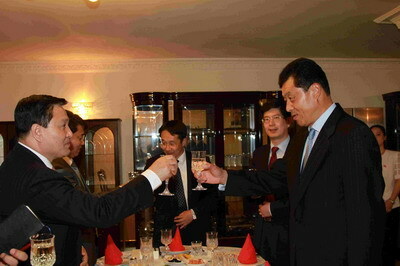 On July 15 2011, Ambassador Liu Xiaoming attended the dinner hosted by DPRK Ambassador to the UK Ja Song-nam in celebration of the 50th anniversary of the China-DPRK Agreement of Friendship, Cooperation and Mutual Assistance. 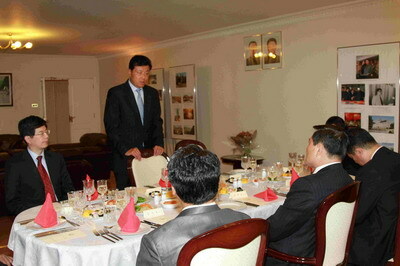 Diplomats from the Chinese and DPRK embassies were present at the dinner. 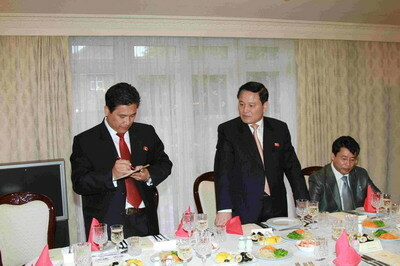 Ambassador Ja Song-nam said in his address at the dinner that the signing of the China-DPRK Agreement of Friendship, Cooperation and Mutual Assistance was an epoch-making event. Over the past 50 years, the two parties and governments have been supporting each other in close cooperation, fully demonstrating the strong vitality of the DPRK-China friendship. The two countries have made great contribution to maintaining peace, stability and prosperity in Northeast Asia and the world. He firmly believed that the traditional friendship between the two countries would be passed on to new generations and grow even stronger. Ambassador Liu Xiaoming said that 50 years ago, Premier Zhou Enlai and President Kim Il-sung signed the landmark China-DPRK Agreement of Friendship, Cooperation and Mutual Assistance, laying a solid foundation for the development of friendly and cooperative relations between the two countries. In recent years, with the personal attention and guidance of the top leaders of the two parties and two countries, the traditional friendship and cooperative relations between China and DPRK have been consolidated and developed. Ambassador Liu said China was ready to work with DPRK comrades to keep up tradition, look ahead to the future, build good-neighborly ties and further strengthen China-DPRK friendly and cooperative relations.